It brings what the company claims to be ‘a best in class’ working height to the 60t machine sector, and can be configured in six different working arrangements. It carries a 2t demolition tool up to a height of 32m, a 3.34t tool up to 28m and it can work with a 5t demolition tool up to 17.4m, enabling operators to work through the widest possible range of activities with optimal control and safety. 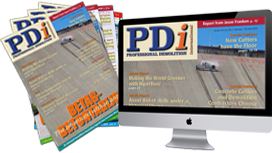 Designed and developed, incorporating customer feedback by Komatsu UK (KUK), it is manufactured at the Komatsu Europe plant located near Newcastle, England. The whole machine works as a single complete system, with smooth and convenient operation, high precision, great stability and first class comfort. With an operating weight ranging from 55,200kg to 73,400kg, power is supplied by a Komatsu EU Stage V compliant engine, which delivers 270 kW at 1,900 rpm, with minimal environmental impact. The new Komatsu PC490HRD-11 excavator is a highly versatile unit which can be easily configured for changing work demands. 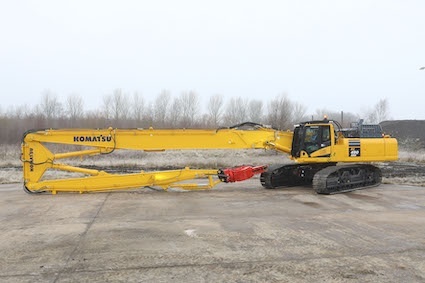 Komatsu’s in house boom change system includes oversized quick connectors for the hydraulic lines to minimise back pressure and oil heating, without restricting oil flow. The system also features hydraulically powered pins, which are mounted inside the main boom structure, thereby reducing risk of damage. Komatsu has also focused on the transportation of the PC490HRD-11. Every section of the working equipment is provided with tie down points and lifting eyes to allow the equipment to be lifted and secured onto a trailer safely. The machine itself has been kept as compact and light as possible, without compromising durability. The new excavator’s standard undercarriage is mechanically variable: it keeps the weight down and maintains exceptional stability with a minimum transport width of less than 3m. The optional hydraulically variable undercarriage makes it exceptionally easy and quick to set up the machine on site, achieving a working width of nearly 4m.